You may recall that I like to eat tofu. And why not? As a almost-vegetarian, I worry about getting enough protein in my diet. Tofu is an excellent source of protein and it is so versatile. You can bake it, broil it, stew it, add it to casseroles or soups, make it into a dip…and more! Admittedly, tofu, when eaten on its own, tofu can be kind of bland. But, although tofu is nearly tasteless on its own, it does have this fabulous capacity to absorb flavors from other ingredients in recipes. I love it in stir fry with some soy sauce, string beans, and a bit of ginger. I have shared a recipe or two with you in the past that calls for tofu, including yummy Vegetarian Tofu with Peanut Ginger Sauce, many of you later shared with me that you loved that dish. I also made a recommendation for some of my favorite pasta noodles that are made with tofu, Wildwood Pasta Slim Noodles which are amazing! 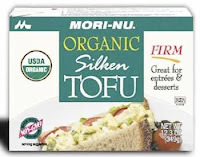 For those of you who are not familiar with tofu, it is available in both a regular and silken form. Silken tofu is often called soft tofu, or even just “Japanese” tofu, in some instances. This tofu is much, much softer than regular tofu, which means that it will fall apart quite easily if not handled appropriately. Silken tofu is required in a number of different vegan and low calorie recipes, particularly when making sauces, desserts or salad dressings. One thing that I really like about silken tofu is that you can use it as a substitute for sour cream (like on top of a baked potato) or in place of yogurt (such as when making a smoothie). In fact, you could replace the almond milk in my favorite Banana Smoothie with silken tofu to end up with a delicious and nutritious, filling breakfast or snack. The best part about tofu is that it is pretty low in calories, and because it is so protein rich, a little goes a long way. For instance, silken tofu is just 1 weight watchers points plus points for 3 ounces. Whatever you do with your tofu, you can rest assured that tofu is a good for you food that you can do a lot with! Share your tofu ideas with me here! I love silken tofu, it is great in smoothies or mousse.